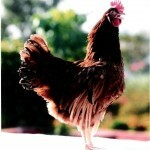 BV380 is chocolate brown feathered bird and is color sexable variety. Egg shell color is uniform brown. 21 – 72 Weeks 7.5 kg.